(Stephen) King of the Road! | The Walking Dad! Ah, the roadtrip. One of the great bonding experiences you’ll ever have as a parent. Conversations, books on tape, restaurants, cool sites and one teachable experience after another. Just make sure you limit the video game and DVD time. And if you’ve never done it before, leave the 26-hour roadtrips to pros like me. The drive down to Dallas from CT was about as well as could be expected. A whopping 26 hours with a two-day stop in Charlotte. But that’s a whole ‘nother, less interesting story. It’s the ride back that is the subject of my very first blog ever. Coming home started off fine. I got to attend George Fraser’s PowerNetworking Conference. My wife got to see her cousins. And my two sons (14 and 12 years of age) had a pretty good time, too — Even though they were disappointed that they went all the way to Texas and did not see a single Cowboy or Scorpion. Actually, I was a little disappointed too. But the barbeque did score major points. We stopped at every state to take a photo in the welcome area next to the sign. Well I did. The rest of the fam could care less. Sometimes it’s hard to tell which one of us is the adult and who are the kids. Conversation was great and we made interesting observations like that Tennessee has to be the widest state in the country. It took, like, 12 hours to travel all the way across. And Arkansas needs to remodel their rest stops. Hoping the lights are from an approaching tow truck and not an impending alien abduction. Anyway, shortly after we hit Virginia, Virginia decided to hit back. And she hit back hard. BOOM! We heard. Aw, man, did we really blow a tire at 10 o’clock at night? The good news is that we didn’t. The bad news is we had blown our engine. 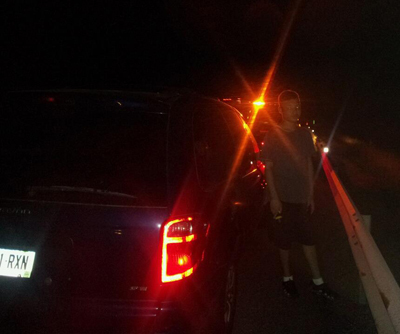 So first we call our insurance company who promptly found us a towing service. The truck came in about 30-40 minutes. Not bad. “You’ve blown your engine,” he said. Now THAT was bad. Plus, the cabin of his truck only held two folks. There were 4 of us. So he had to call another. After a pow wow, they decided to take us to a town called Staunton (pronounced Stanton — at least that’s how THEY pronounced it). Naturally all service stations were closed, so they decided to take us to a hotel. Here’s where it started to rain. A downpour. First hotel didn’t have a single vacancy. Second hotel also didn’t have a single vacancy. So we drove, very slowly, to a third hotel. Me and my driver and van in the first truck, my wife and kids in the second following closely behind. No vacancy. Same for the 4th and 5th. It turns out that this town’s power had been knocked out in that really bad storm that we had in late June that covered a lot of places in darkness. So not only did the locals who had lost power flee to any hotel that still had lights and AC, but there were dozens of folks from the power company staying in town. Unsuspecting family from out-of-town? Check! No hotel vacancies? Wouldn’t be the same without it! Finally we checked one last hotel. If they didn’t have any rooms, then me, my wife and two sons would have to sleep in our van in the parking lot of a service station. So as we say good night to each other as we make the seats in the van recline, we took a moment to reflect on the evening. Oh, before they dropped us off there, they took us to the only place in town that was still serving food. The corner Getty station. They boasted a wonderful spread of one last turkey sandwich as well as 3 hot dogs that had been on the grill for so long that the woman behind the counter didn’t have the heart to charge us for. Mmmm that’s good eating. Now when I say that we went to the Getty station and got gas, well, you can draw your own conclusion. So that was that. My wife, 14-year-old son, 12-year-old son, and myself, in my van; seats reclined; windows cracked just enough to let in air, but not enough for someone to reach through and slit our throats. Don’t think I didn’t think of that. At about 2 am we awoke to a loud scream. My wife was freaking out because apparently her tow-truck driver had told her that a lot of the people there were addicted to “bath salts.” That’s apparently the same thing that that guy was high on when he tried to eat that homeless guy’s face. It was in the news. Band of raging homicidal lunatics? Check and MATE! Now here’s where us dads earn our keep. One of the things about being a dad is that it’s our job to guarantee everyone that everything will be okay. No food? No problem. People fast all the time, just think of it as a spiritual cleansing. Have to sleep in our van? Just think of it as camping in a steel tent on wheels. In the middle of a rainstorm? Ah, what soothing sounds. Plus the rain streaming down my face helped in covering up my tears of hopelessness. See? Every cloud has a silver lining (except of course the storm clouds that knocked out all the power in three states. Anyway, turned out we did actually survive til morning and were obviously the first ones on line. But were told that they couldn’t order an engine because their Internet was down and even if they COULD, it would take at least 5 days to get the parts and put it all together. So we went to Enterprise to get a car. Yeah, I know “they’ll pick you up,” but we got a ride just to be safe. And guess what, alls they had (and yes, I meant to type “alls”) was a pick-up truck. Now it was bad enough having my wife sleep in our van, and I have to say she did not complain the entire time. I know, I’m just as shocked as you! But now I was supposed to drive her home from VA to CT in a pick-up. Better than having to drive home in Stephen King’s Christine (a movie about a car who kills people) but not much. Apparently the guys from the power company took all the cars, too. They invited us to hang around and hope that someone returned another car. We did. They did. So we drove home in a Toyota something something. It was very nice. And the good thing is there’s an Enterprise right down the block from my house. I could just drop it off there! No, I can’t drop it off there, because there is a drop off fee of $1 per mile. So since CT is 422 miles away, that means I would be charged $422 just to return the car down the block from my house in the morning. Believe it or not, I actually SAVED money by keeping the car from Monday all the way until the next Monday, then drove it back down to VA to get my van. My boys came with me. We listened to a great book on tape about vampires. Ate at Waffle House. So there you have it. My trip back from Texas to Connecticut, by way of Virgina with a stop over in Salem’s Lot. If what doesn’t kill you, makes you stronger, then I am the Incredible Hulk-Dad! My van definitely didn’t last forever, but the memories of this trip definitely will. Did anyone need to go to the restroom?. You know, now that I think of it, we didn’t. Not a big deal for me ’cause I have a canteen for a bladder, but no one else had to either. I guess the fear of being pulled into the Mist by a “bath salts” crazed maniac will do that. Thanks for reading. No but when you find civilization come get me I will be under the seat!!! What a chuckle!! Awesome story telling Jerry! You should have been blogging for a while now. Read the whole, I smiled, chuckled and gasped a time or two. Keep it coming! Coy, I’ll always remember you as my very first reader. We’re bonded for life. Now you have to come on our next road trip! Awww man that ain’t nothing!!! I killed two vampires, a werewolf and a shapeshifter on my way from Brooklyn to Harlem on the last full moon. Then I woke up… Baaahaahaa! Seriously I’m glad nothing major happened to you or your families health when the engine blew out. Its a very scary thing, especially on a highway. Just think how many folks live in their car like that on a regular. Always remember how blessed you are. One Love Jerry. Trisha, you’re absolutely right about folks living in their cars. Thanks for the reminder! now that y’all are safe and sound, that was just too funny, my friend! keep up the great work. Hey Jerry that was Awesome. I am sure that experience created a bond with your family that will never be forgotten. If I was in your wife’s shoe; I would be screeeeming for a bathroom with all the amenities. And since I dont eat meat and fast food mmmm. I took a trip from Sedona to California with my daughters. They never forgot. Great story. Thx for sharing! He did Sedona a few years back. Flew to L.A., the drove to Disney Land, Phoenix, Sedona, Grand Canyon, then flew out of Vegas. A LOT smoother trip! But you’re right, they won’t forget the bad ones, but they REALLY won’t forget the good ones. Thanks for reading! Great job, but I’m not surprised, I’m your number 1 fan! Really enjoyed your essay. You’re an inspiration. Yep, yep. Been most of here, done a lot of this, but your version is way more lively! lol! Hi, Jerry, it’s me, Monica, the puzzle lady from around the way. So nice to see your blogging on fatherhood. I’ll be reading. In all those miles our worse case scenario was breaking a tensioner arm. Car was drivable just not power steering, AC, etc. It was broad daylight, on the NJ turnpike next to an exit. Virtually walking distant from hotel and car repair shop. Order pizza for dinner, go two comfortable rooms and car ready the next by noon the next day. Well sure if you want to do it the easy way!